Having a large 0.96 inch OLED display and a new easy-to-go interface, the Joyetech Evic Primo SE 80w is a beautiful compact starter mod. It makes no sacrifice to power or functions compared to its predecessors. The Joyetech Evic Primo SE 80w reache.. The Geekvape Aegis Solo 100W is a mini version of the well known Aegis mod, with 18650 battery, sophisticated AS chipset and tough construction. It is made of zinc alloy combined with leather for ergonomic grip and SLI Silicon body for enhanced durab.. The iJoy SHOGUN 180W TC Box Mod is a sensational dual 18650 platform vape mod, integrating an intelligent UNIV Chipset with highly functional output settings within a stunningly designed resin panel construction. The iJoy SHOGUN 180W Mod implements a.. The Eleaf iKonn 220 supports dual 18650 batteries with a maximum power of 220W. It has a big 0.91 inch screen that offers a concise and clear interface with two separate battery bars. It features a battery balancing trickle charge system and a 2A qui..
Eleaf introduces the new, innovative iStick Pico Baby, which offers exceptional power and at the same time very small size. It has a magnetic mechanism that connects the atomizer very easily with the mod. 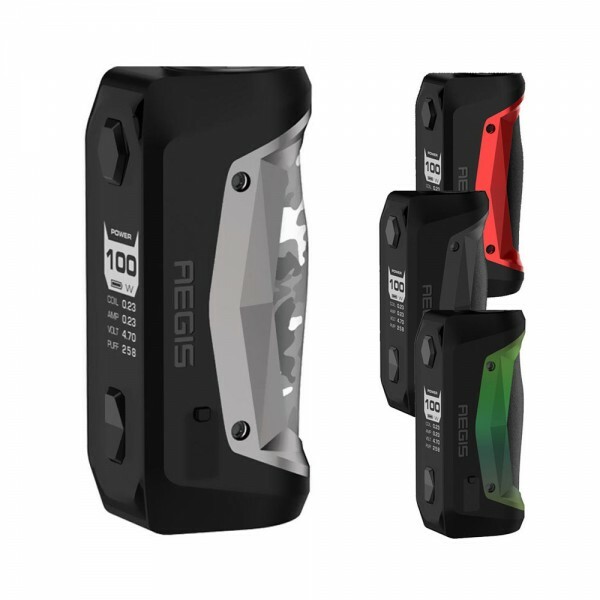 The rotary locking system of the fire but..
GeekVape Aegis Legend Box Mod The Aegis Legend is a stylish box mod designed to be water and shock resistant. It is compatible with dual 18650 batteries and powered by the new AS chipset that releases up to 200W output. This is a second to none ch..
Eleaf iStick Pico S 21700 Inspired by sports car, Eleaf new iStick Pico S is meticulously designed to be the most visually appealing setup, having a bare battery tube with the design of corroded texture and decorative 7-color LEDs. In addition to ..
Joyetech Espion Solo 80W Featuring a particularly responsive touchscreen, the sophisticated ESPION Solo is very convenient for you to operate. It is the first box mod that compatible with 21700 battery, but still works with 18650 battery as well. ..
Eleaf iStick Pico 21700 iStick Pico 21700, the newest addition to Eleaf iStick Pico family, is compatible with 21700 battery as well as 18650 battery. A high drain 4000mAh 21700 battery is included in the box. The iStick Pico 21700 retains the co..
Eleaf iStick Pico 25 The iStick Pico 25 ingeniously packs a big 0.91-inch screen that offers a concise and clear interface, 2A quick charge capability and upgradeable firmware with preheat function in a compact, stylish yet powerful package. Powe..
Eleaf Tessera Designed with low-poly elements and high-performance experience in mind, the new TESSERA is elaborately engineered in every single detail to be not only visually appealing but versatile. It features a 1.45 inch TFT color display and ..
Eleaf Invoke 220w Body The Eleaf Invoke is a giant step for Eleaf with a centered 510 and larger 1.3-inch display. A beast behind the beauty, Eleaf Invoke boasts an elegantly crafted compact profile while allowing a massive output power of 220 wat..
Joyetech eVic Primo 2.0 + UNIMAX 2 Powered by dual replaceable 18650 batteries, the eVic Primo 2.0 provides durability and reliability with a 228W maximum output. Featuring the new equalizing charge system, it supports 2.0A quick charge capability..
Joyetech CUBOID Lite CUBOID Lite is truly small! It features a large 1.45 inch display and the most advanced vaping system. The Joyetech CUBOID Lite is such one of a kind box mod that aesthetically fits your hand comfortably. Powered by a 3000mAh ..
GeekVape Aegis 100W Box Mod GeekVape Aegis MOD, designed by Geekvape GM Justin and Invader mini's chief designer, brings you a legendary TC box mod. It features a waterproof, shockproof and dust-proof design by adopting advanced LSR Injection Moul..
Joyetech CuBox + Joyetech Cubis 2 Atomizer Joyetech CuBox Being simple and compact, the CuBox features one of the most elegant starter mod with visually stunning designs available. Powered by an integrated 3000mAh battery and 2A quick charge, i..
eCig e-Box Mini 80W + Joyetech Cubis 2 Atomizer eCig e-Box Mini 80W Having a large 1.3 inch OLED display and a new easy-to-go interface, the eCig e-Box Mini is a compact starter mod available in multiple attractive colors. It makes no sacrifice..